FIG. 5. 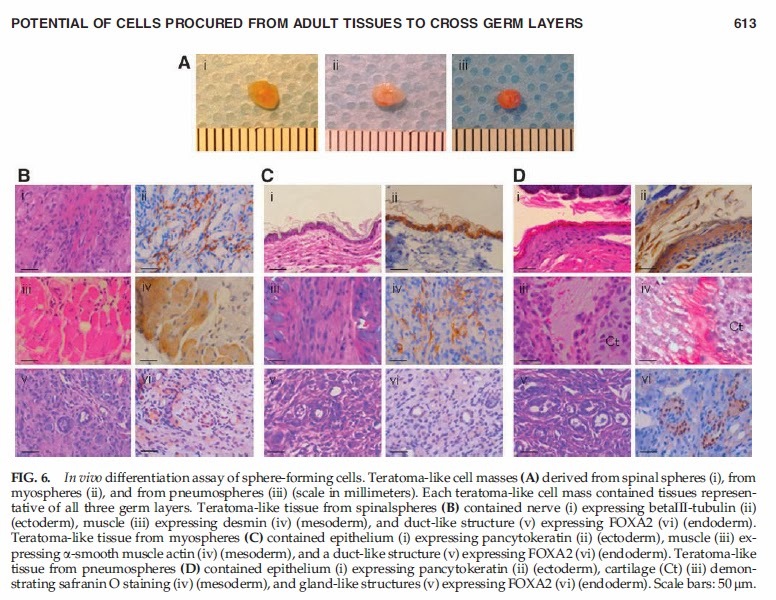 Differentiation assay of spheres derived from different adult tissue types into cells representative of the three germ layers. 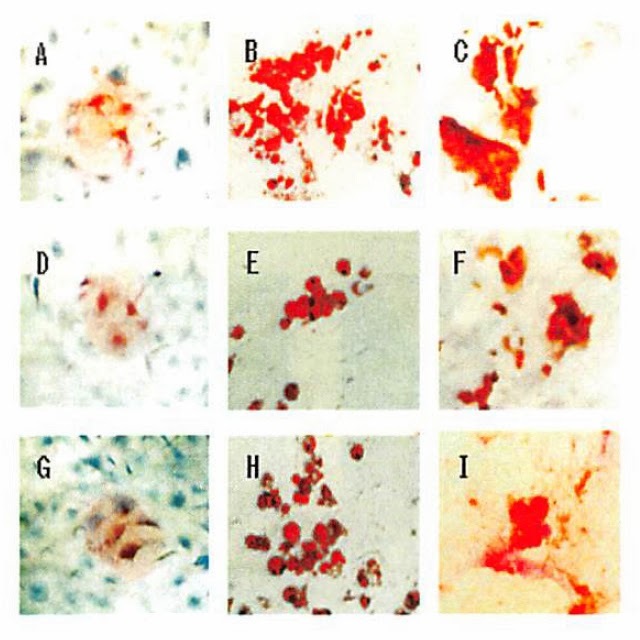 Differentiation assay from spinal spheres (A) into neural cells (i, ii, and iii), muscle cells (iv, v, and vi), and hepatocytes (vii, viii, and ix). bIII tubulin-expressing neurons are shown in green (i), GFAP-expressing glias are shown in red (ii), and O4- expressing oligodendrocytes are shown in red (iii). a-smooth muscle actin-expressing smooth muscle cells are shown in red (iv), myosin-expressing cells are shown in green (v), and desmin-expressing cells are shown in red (vi). 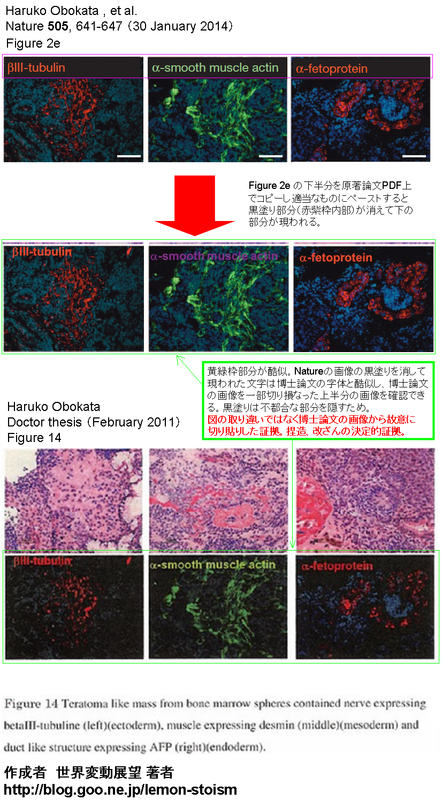 AFP-expressing cells are shown in red (vii), albumin-expressing cells are shown in red (viii), and CK18 are shown in green (ix). 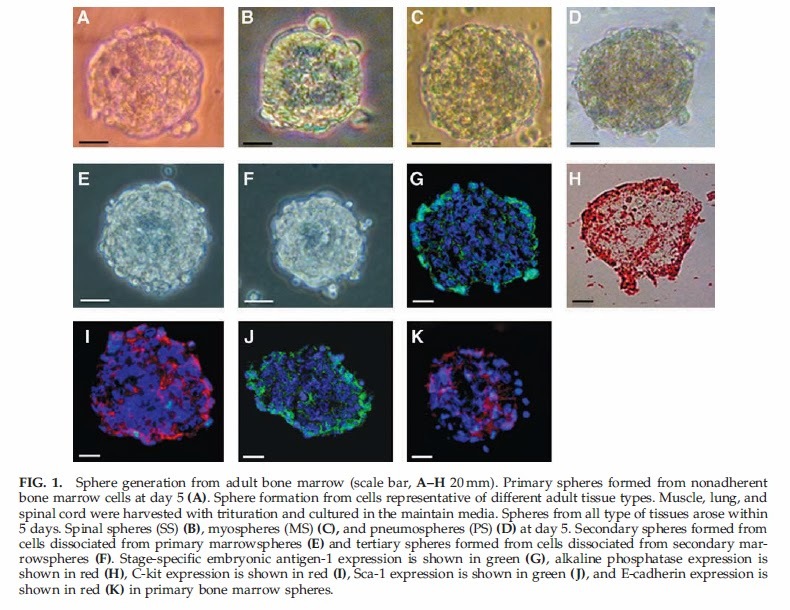 Differentiation assay from pneumospheres (B) into neural cells (i, ii, and iii), muscle cells (iv, v, and vi), and hepatocytes (vii, viii, and ix). bIII tubulinexpressing neurons are shown in green (i), GFAP-expressing glias are shown in red (ii), and O4-expressing oligodendrocytes are shown in red (iii). a-smooth muscle actin-expressing smooth muscle cells are shown in red (iv), myosin-expressing cells are shown in green (v), and desmin-expressing cells are shown in red (vi). AFP-expressing cells are shown in red (vii), albuminexpressing cells are shown in red (viii), and CK18 are shown in green (ix). 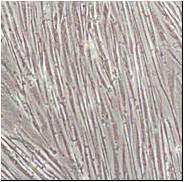 Differentiation assay from myospheres (C) into neural cells (i, ii, and iii), muscle cells (iv, v, and vi) cells, and hepatocytes (vii, viii, and ix). bIII tubulin-expressing neurons are shown in green (i), GFAP-expressing glias are shown in red (ii), and O4-expressing oligodendrocytes are shown in red (iii). a-smooth muscle actin-expressing smooth muscle cells are shown in red (iv), myosin-expressing cells are shown in green (v), and desminexpressing cells are shown in red (vi). AFP-expressing cells are shown in red (vii), albumin-expressing cells are shown in red (viii), and CK18 are shown in green (ix). Nuclei were stained with 40,6-diamidino-2-phenylindole (DAPI). 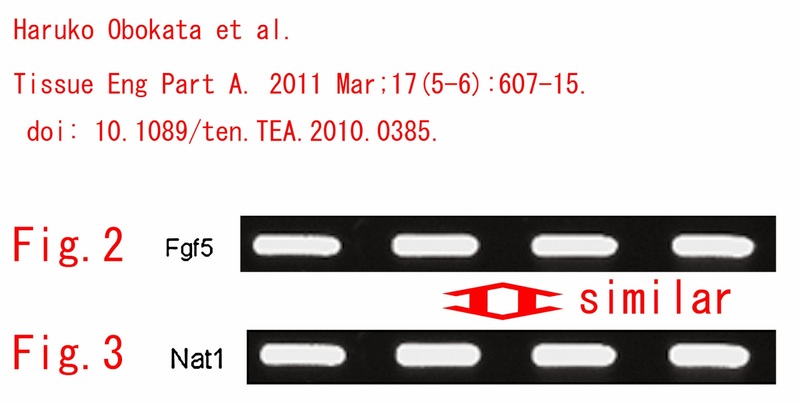 Scale bars: 50mm. cross germ layers when maintained in appropriate environments. they had sphere forming potency in the serum-free condition. 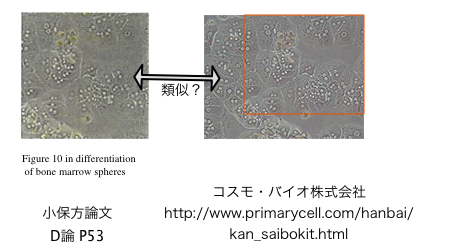 than 8 micro meters in diameter cells were isolated. 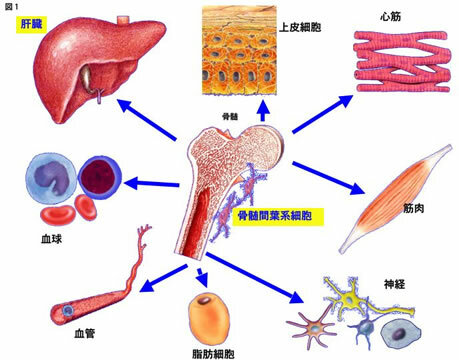 liquid to destroy mature cells. 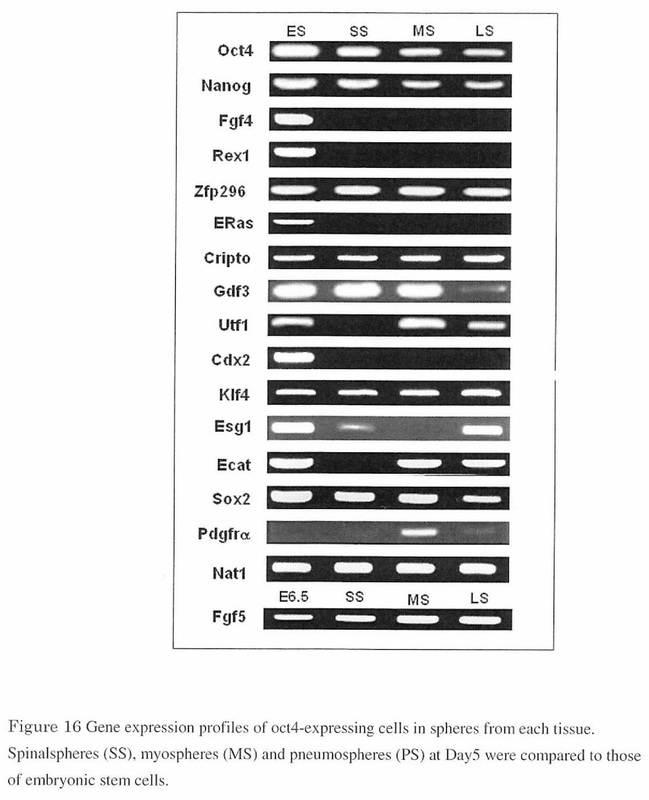 pipettes many times and destroyed by mechanical stress. 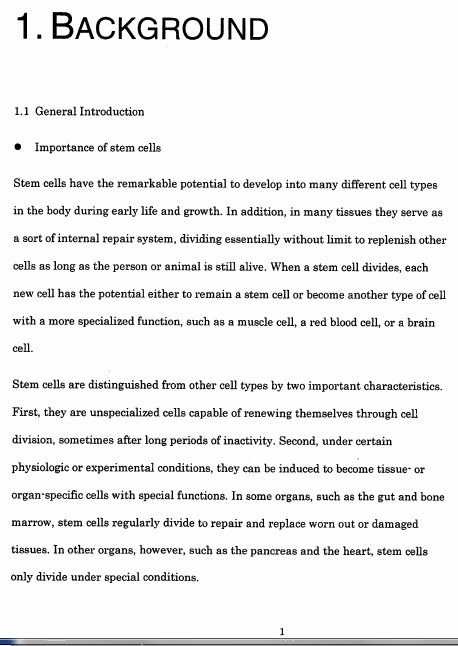 were counted as a number of stem cells. 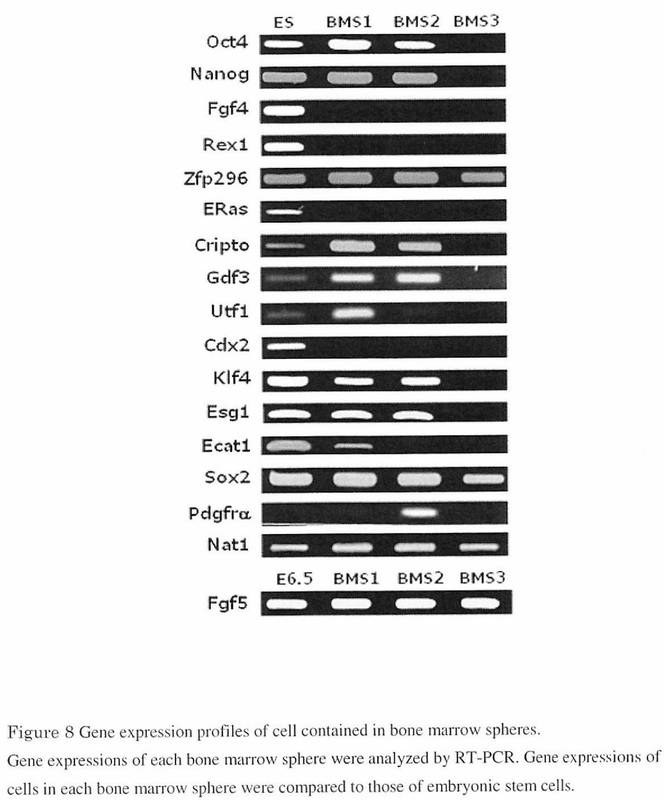 polymerase on an iCycler for 35 cycles. utilized trituration as the isolation method of small cells. meters in diameter disappeared. 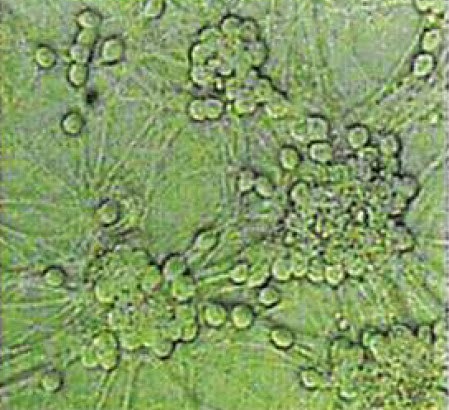 Triturated cells formed spheres during culture. 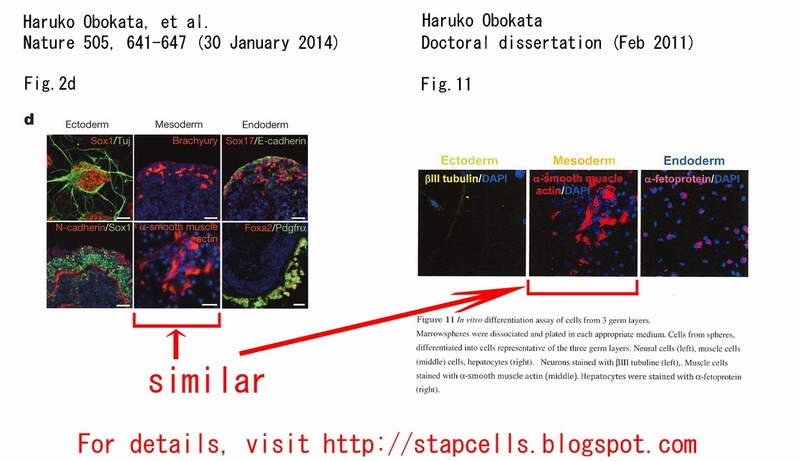 demonstrated that trituration enabled to culture and grow only small cells. 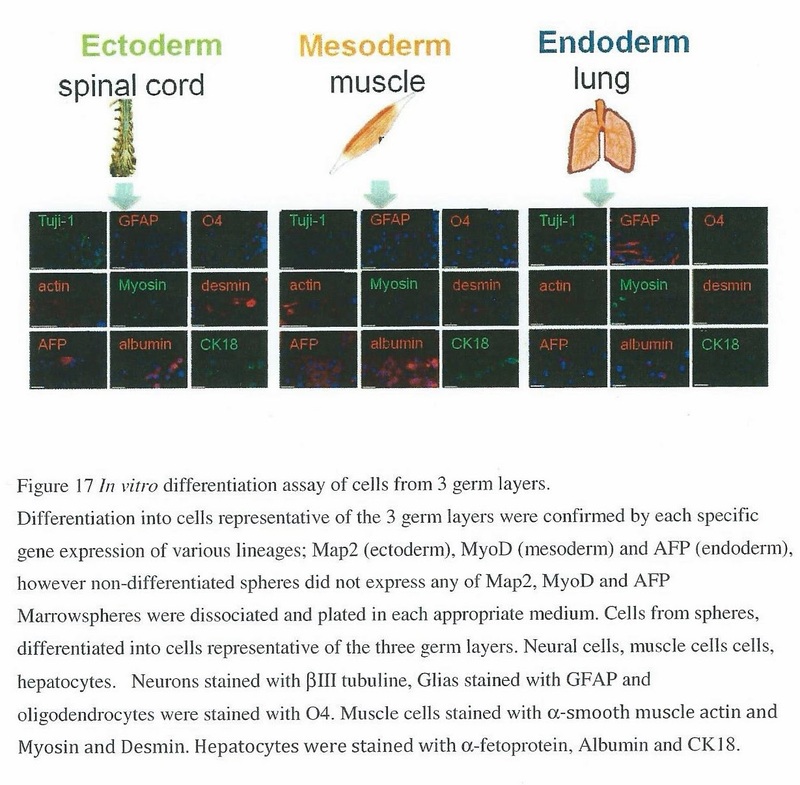 Figure 12 Mesenchymal lineage differentiation. 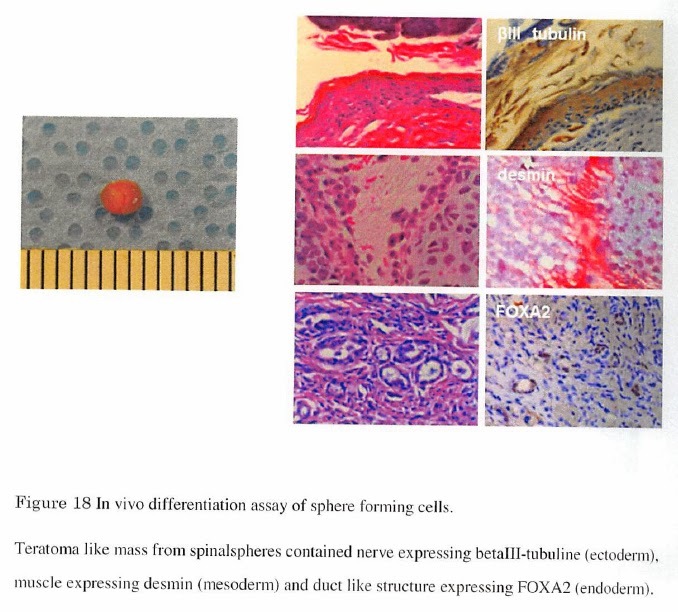 cells were from spheres derived from endoderm or ectoderm tissues. (F). 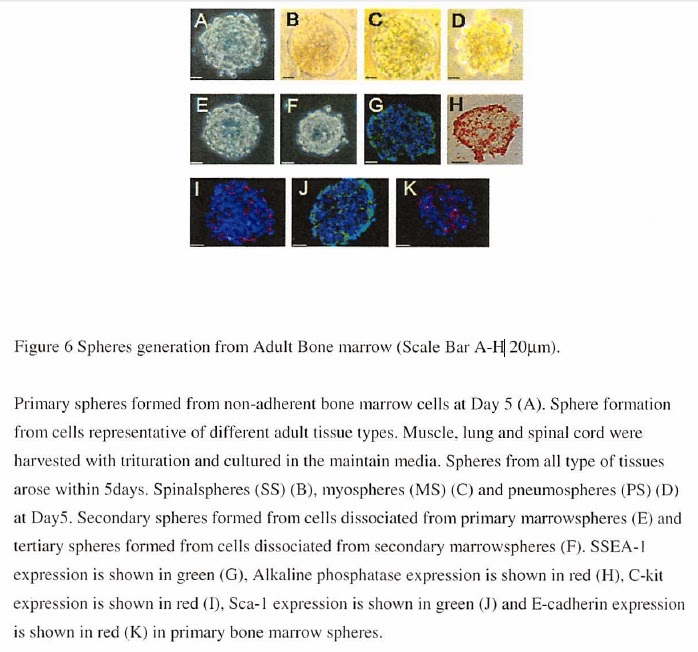 Spinalspheres differentiated into condrocytes (G) and adipocytes (H). Things're getting worse. How pathetic! 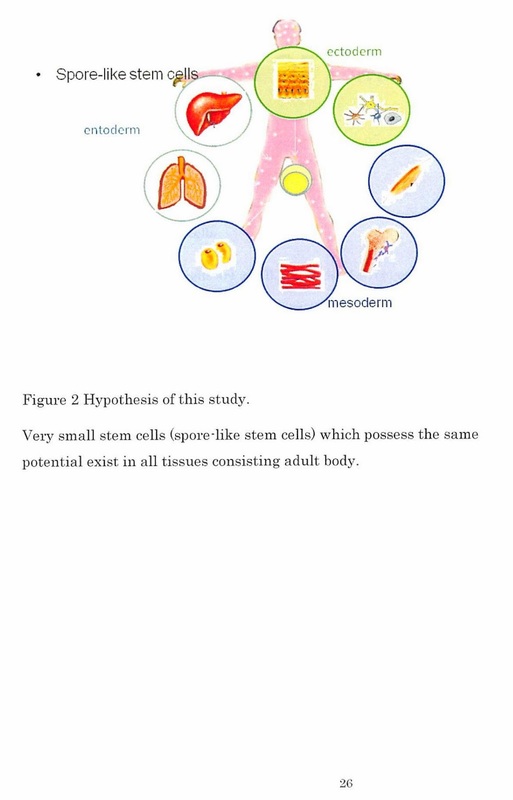 Obokata H, Yamato M, >>Yang J<<, Nishida K, Tsuneda S, Okano T. Subcutaneous transplantation of autologous oral mucosal epithelial cell sheets fabricated on temperature-responsive culture dishes. 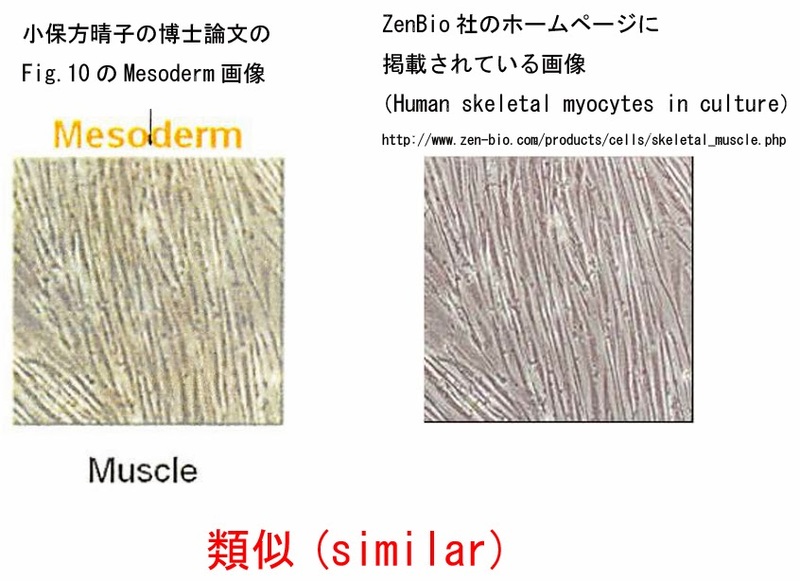 >>J Biomed Mater Res A. 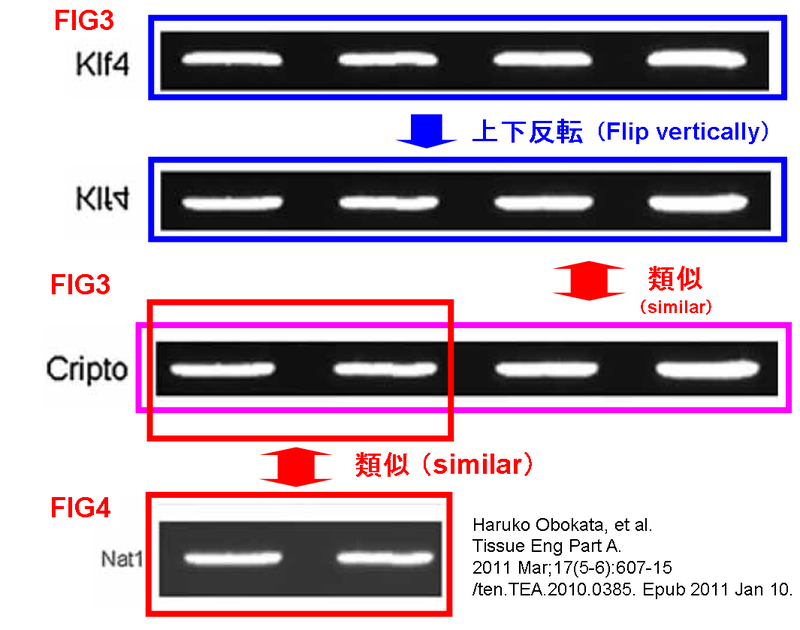 2008 Sep 15; 86(4):1088-96<<. Haruko Obokata, Jason Ross and Charles A. Vacanti. As an American who is a long term resident of Japan and has worked at Japanese companies here, I have long agonized at the sloppy nature of work I have witnessed at these companies. 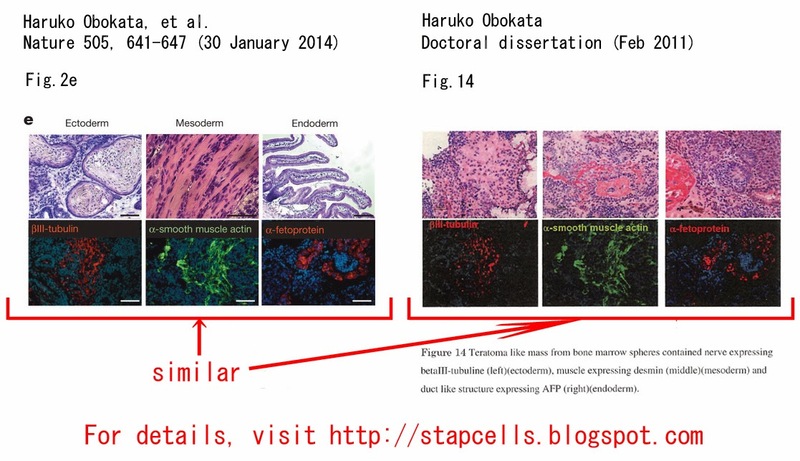 This call for retraction of the Japanese stem cell study by one of the Japanese co-authors has once again put the spotlight on this problem. Foreigners have an image of the Japanese as very thorough, detail-oriented, and meticulous. >However, my experience in Japan over more than a decade has been just the opposite of this. >Things got so bad at my Japanese company that everytime I would check my Japanese subordinates’ work, for me it was never a matter of if I would find mistakes, but how many mistakes would I eventually end up finding. Many of these were due to pure sloppiness, carelessness, an inability to think independently, critically or to ask questions, a blind allegiance to protocol and hierarchy, and a fear of being perceived as a troublemaker or someone who is not a team player. This helped me understand why Japanese companies place such importance on manuals, rules and doing things by the book, since the Japanese are usually very good at following rules that have been written down for them. This style may work well for manufacturing industries, but not for research, STEM fields (Science, Technology, Engineering and Maths), or in the knowledge and service industries of the future. During biofilm development, a large number of phenomena occur simultaneously and interact over a wide range of length and time scales. As a result of nutrient conversions, the biofilm expands on the basis of bacterial growth and production of extracellular polymeric substances(EPS). Advances in mathematical modeling of biofilm structure. 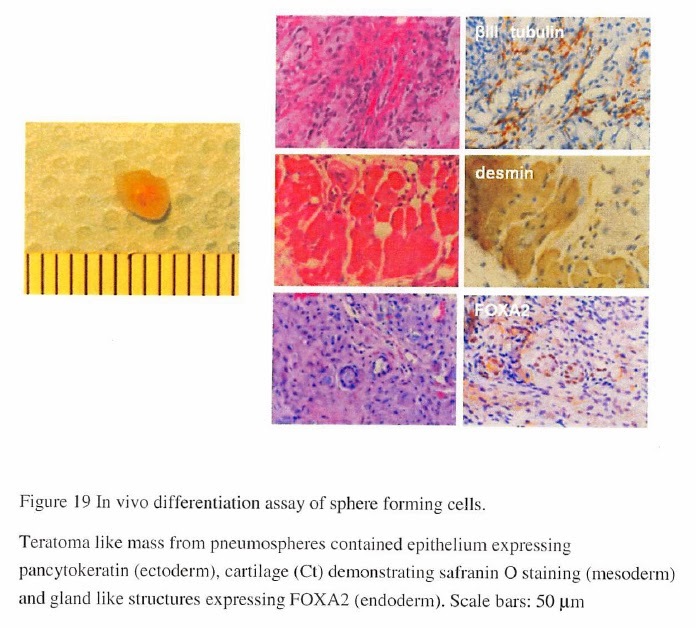 Biofilms 1, 1–13.